Observe old trees in nature, and you will see plenty of variation. Trees grow upright or slanting, in groups, pairs, or alone, out on plains or clinging to the sides of mountains. They are found in arid, moist, hot, freezing, still, and windy environments, and everywhere in between. Wherever they grow, trees are also affected by animals and diseases. All the stresses that nature places on trees are reflected in their shapes. Bonsai artists look at what nature creates with these factors and work to emulate it when shaping a tree, but they also add their own vision to produce a beautiful bonsai. That’s why a bonsai is so much more than just a tree in a container. 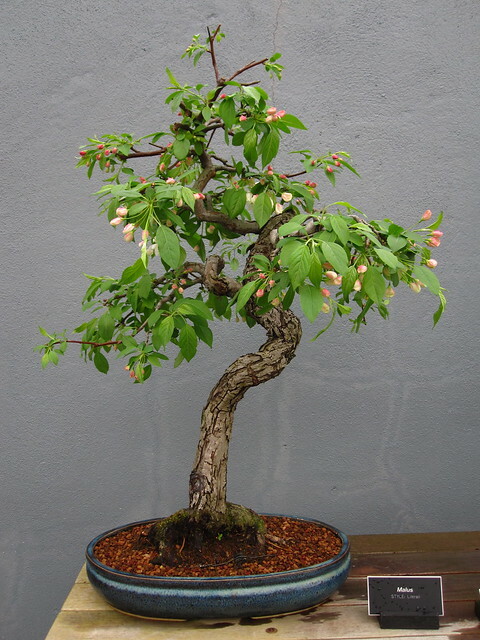 Bonsai styles can be grouped in many ways. Five basic forms derive their names from the tree’s angle of growth from a container and provide a common starting point for exploring styles. The bonsai of this style are reminiscent of trees growing in nature in an open location without stress. The trunk line is vertical with the apex located over the center of the trunk base, and must taper from base to apex. Each sucessive branch is, or appears to be, shorter than those below it and when the distance between branches decreases as they near the apex. 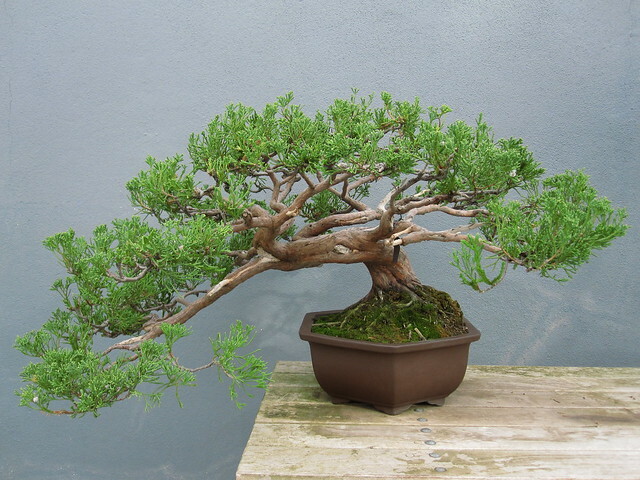 This style is probably the most popular one in the bonsai. It depicts a tree in nature that has suffered from the elements, with a trunk line showing contortion and branches that sag. In nature, this shape is created by the constant breaking of the trunk line by storms, ice, snow, or the actions of animals and insects. 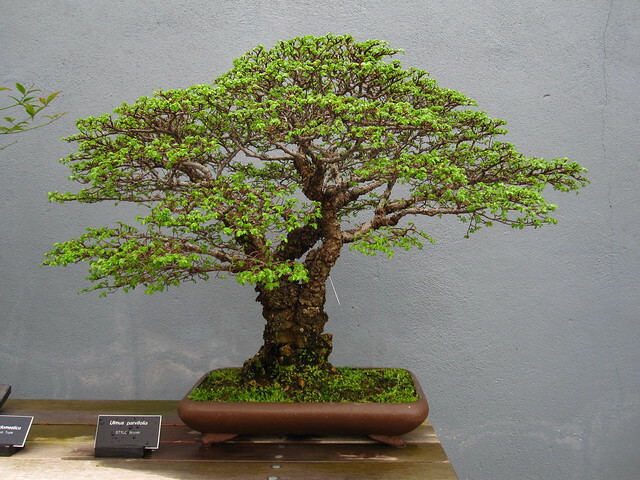 In creating this style, bonsai artists start with a tree that already shows the stresses that nature has imposed on it, or create the trunk movement by the use of wire and other methods. Looking at trees in nature, one often sees individuals that have been tilted to one side by the forces of wind or water, or ones that lean at an angle reaching for sunlight. These trees have developed strong root systems on one side to counter the weight of the tree’s slant to the other side. As artists develop a bonsai in this style, they must carefully observe its counterparts in the real world to duplicate their shapes. For this design to work, balance must be achieved visually by size and placement of the roots and branches. This style is meant to depict a tree hanging from the side of a cliff by the seashore or a stream. The tree grows over the edge of the pot, and the trunk bends downward beyond the rim of the container but not below its base. Juniperus chinensis ‘Torulosa’ in semi-cascade style. Photo by Rebecca Bullene. 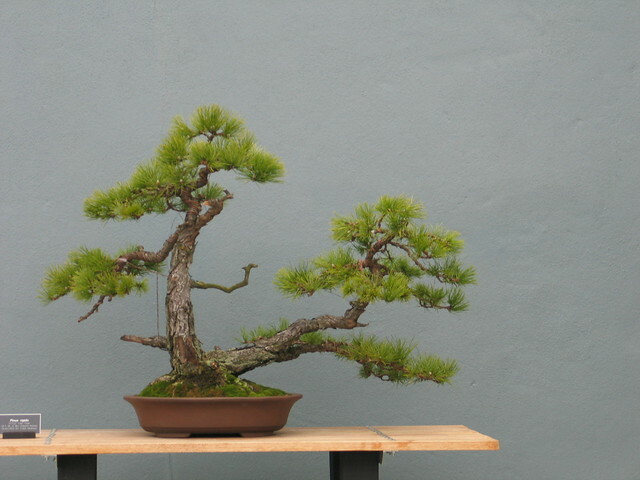 This bonsai style follows the rules of semi-cascade except that the cascading line falls below the base of the container. 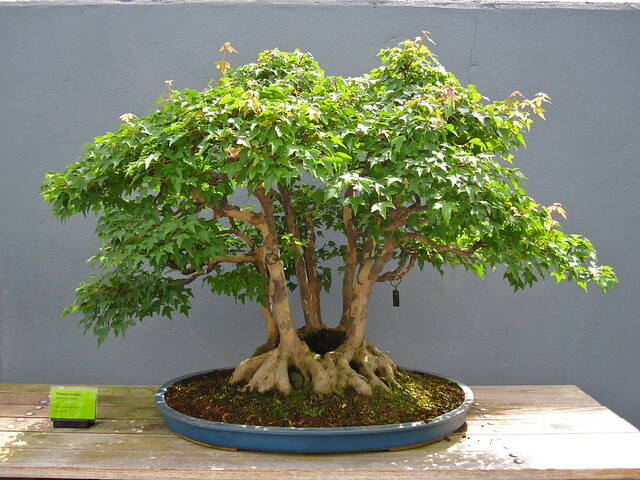 This requires that the bonsai be displayed on a stand so that the trunk line can extend as far as it needs to. 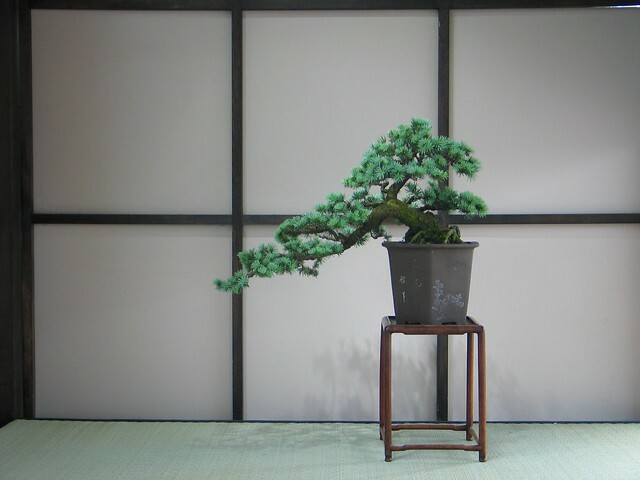 Aesthetically, the tree must never touch the surface of the stand upon which it is displayed. .
Blue atlas cedar in cascade style. Photo by Julian Velasco. 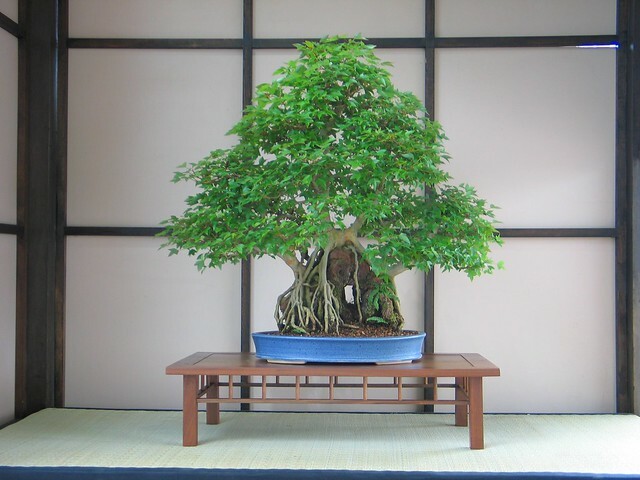 The following styles of bonsai are modifications of these five basic styles. 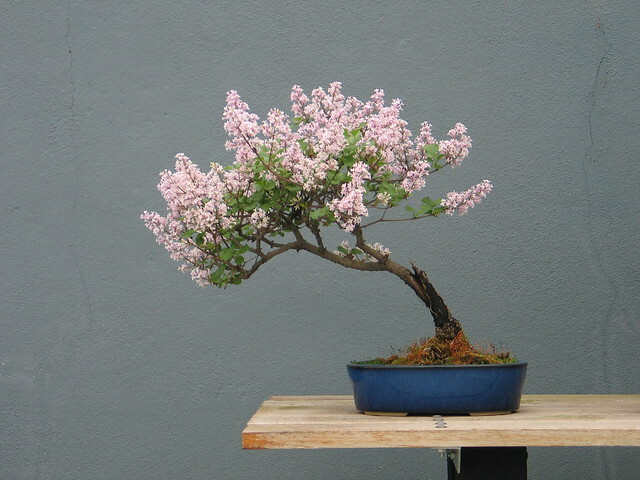 Broom-style bonsai resemble the old trees found along city streets or in orchards. A deciduous species is groomed to form a crown of radial branches that show a great deal of ramification (branching twigs), thereby creating a beautiful reflection of an old tree. Some broom styles have a main trunk line that extends from the base of the trunk to the apex; others have branches radiating from one central point, as shown in the drawing. 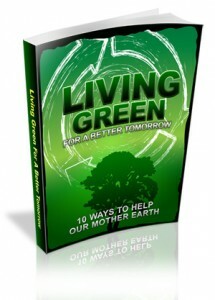 In nature, rain and weather can erode soil from the base of a tree, slowly exposing its roots over the years. 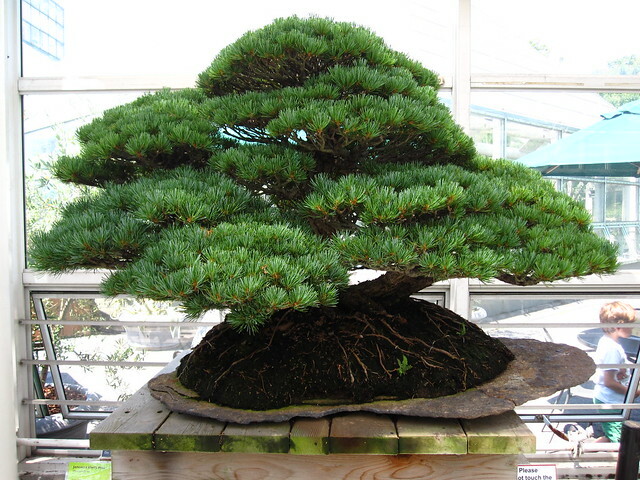 Bonsai artists like to exaggerate this effect and show a great deal of root structure. This effect must be developed over a long period of time by baring only a bit of the roots each year and allowing the exposed area to harden off. 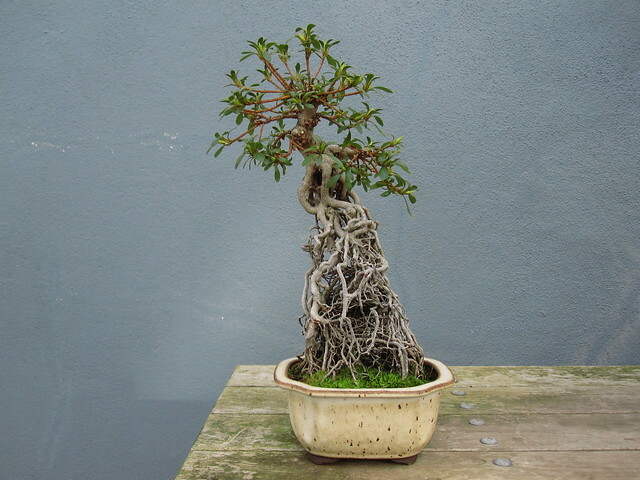 Satsuki azalea in exposed root style. Photo by Rebecca Bullene. When a seed lands in a crack in a rock and finds enough soil to survive, the plant’s roots may eventually grow to spread among the thin layers of soil and moss across the rock. In another scenario, the roots slowly grow over and around the rock to the soil below, partially encasing the rock. In bonsai, this effect is created by spreading roots over a rock and then allowing the roots to develop. One way to do this is to bury the rock among the roots when the plant is potted, and let them grow for a period of years before slowly exposing them over time and allowing them to harden off, as done with the exposed root style. This style depicts a tree with two trunks. The trunks, usually of two trees of different diameters, have grown together at the base, and the two trees are styled as one. No branches are permitted to grow between the trunks. In the natural scenario this style seeks to emulate, a woodland tree is damaged by a storm and blown over, breaking the branches on the downward side. Over time, roots develop from the trunk resting on the soil, and the remaining branches (rising vertically from the undamaged side of the trunk) grow to look like new trees connected by the old trunk. 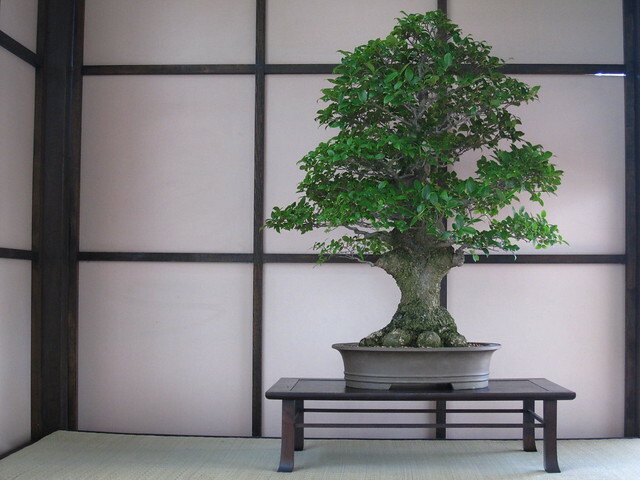 In bonsai, a one-sided tree is wired and laid horizontally on soil, branchless side down. By nicking the bark to expose the cambium layer on the underside of the trunk and dusting it with rooting powder, the growth of roots is facilitated. A straight trunk usually forms a straight line of trees; using a curved trunk creates a more interesting pattern of trees that resembles a small grove. When a cone or fruit containing several seeds falls in fertile soil and several trees grow at the same time, they may merge to form a tree with multiple trunks. Each trunk naturally bends outward from the group to reach for the light. The clump style in bonsai is created by planting a number of seedlings tightly together and styling them to form outward-reaching trunks. 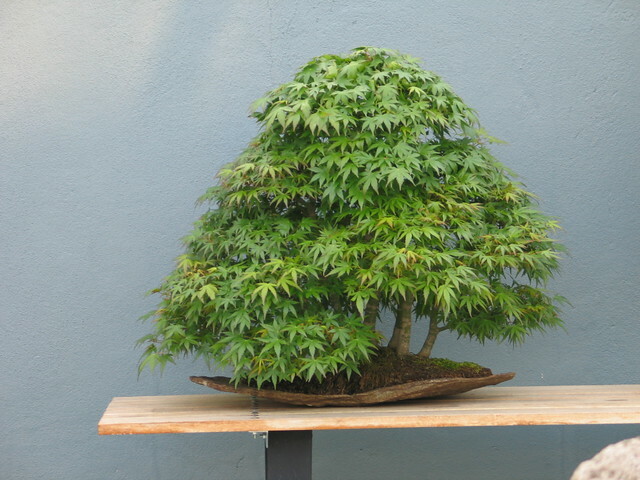 Using five or more trees, artists can create bonsai resembling small or large forests. Sometimes the forest is styled to look as if it reaches far into the distance. By placing smaller trees in front and progressively larger ones behind, a far-view perspective can be achieved. Another perspective—that of a viewer amid the trees and looking at the forest stretching beyond—is created by placing larger plants in the front. In all cases, use trees of different diameters and heights and arrange them so that no three trees are placed in a straight line when viewed from the front or the side. The trees are all placed at different distances from each other. The overall effect is a canopy resembling a scalene triangle. 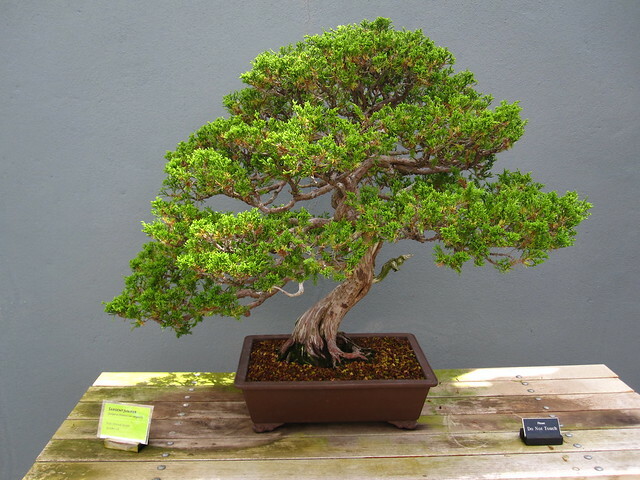 The literati style of bonsai is meant to show the essence of a tree. A literati has a beautiful, thin, and unique trunk line. Branches are kept to a minimum. This style is often thought to be the most difficult to achieve. Only a bonsai artist who has mastered all the rules and created great designs can successfully break the classic rules and create elegant literati. In nature, weeping trees like willows are often found in damp areas and along streams and lakes. 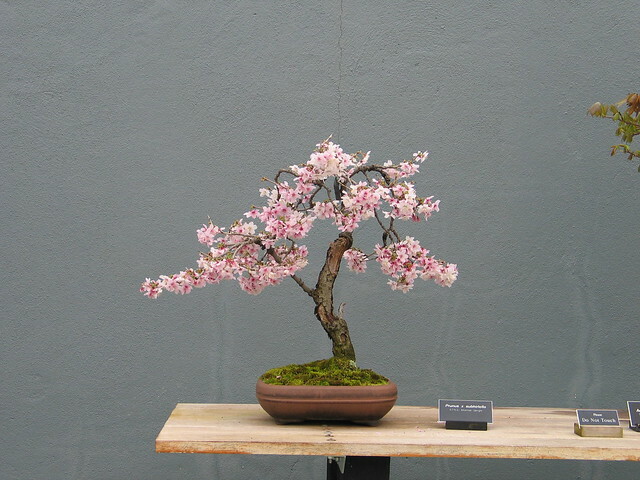 Bonsai artists replicate this vision by the careful use of wire to train a tree like a willow or weeping cherry. To create the form in miniature, wire each branch so that it bends upward, and then create a severe downward bend to style the weep.